Spring has sprung! Well, most places it has sprung. I realize a few of you still have melting snow. I have nothing for you. Maybe wear one of these items under your puffer coat. So for today’s Fashion Friday: let’s look at ways to SPRING UP our work wardrobe. If you’re a total color lover like me, then you’re pulling out your greens and yellows for work. But beyond simply color, there’s more that can be done. In order to achieve some of these springy looks, I am seriously considering trying Rent the Runway. The last few colleagues I complimented on their fabulous dresses, each said they were from Rent the Runway. And when I started scanning there options, I got lots of fresh ideas for a spring-a-rific work upgrade. I think polka dots and starkly contrasting stripes seriously read spring. Check out this killer Badgley Mischka navy striped sheath, this fresh polka dot Ralph Lauren belted dress, or this Trina Turk inverted stripe pencil skirt. They read utterly fresh and clean and read for the season. Plus, uber successful professional. Maybe you avoid patterned dresses or blouses as a rule. Or maybe you’re all for patterns but you have gotten stuck in a rut with the handful you already have in your closet. Think of some different types of patterns than those you’ve used or currently have. Step way out with this pink hued leopard wrap dress by Leota. Or throw your favorite blazer over this lavender Diane Von Furstenberg midi dress. Even bigger patterned than either of these is this oversized floral Tory Burch sheath. What say you? 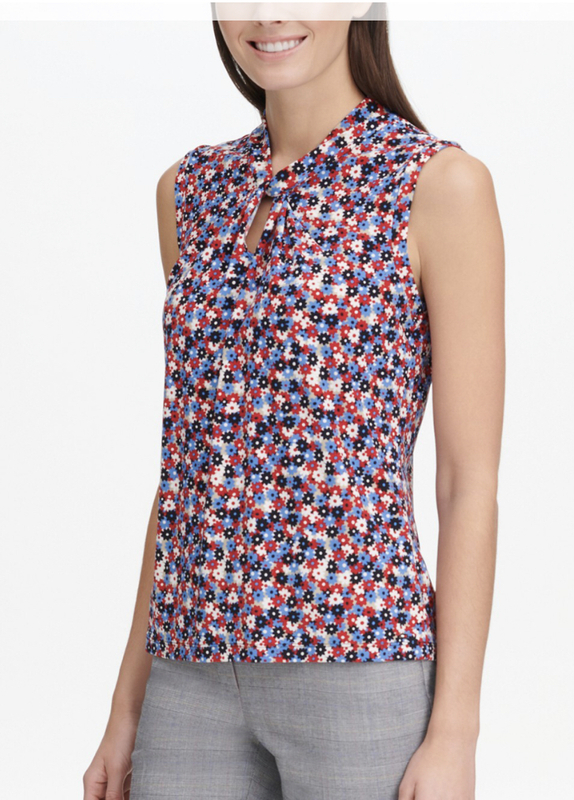 How do you Spring Up your work wardrobe now that the season is here? And what’s you’re biggest work fashion dilemma? I’m back with the second installment of Fashion Friday’s Stars and Stripes Forever!! Two weeks ago I introduced a trend I’m seeing – stripes and red, white and blue. It’s in all the store windows. I’m a huge fan of stripes, as we discussed with all the cute trends last Fashion Friday. But I’m a little more skeptical of red and blue together. It can feel a little too Fourth-of-July-y. There are some fun, bright ways to wear it that make it feel more classic and less holiday-ish. I first spotted the trend in the Michael Kors shop windows. He manages to make it feel less campy (except for the print tee) by selecting the blue or red as a primary and only accenting with the alternating color. Next, I popped over to Macy’s to pick up my eyeliner. 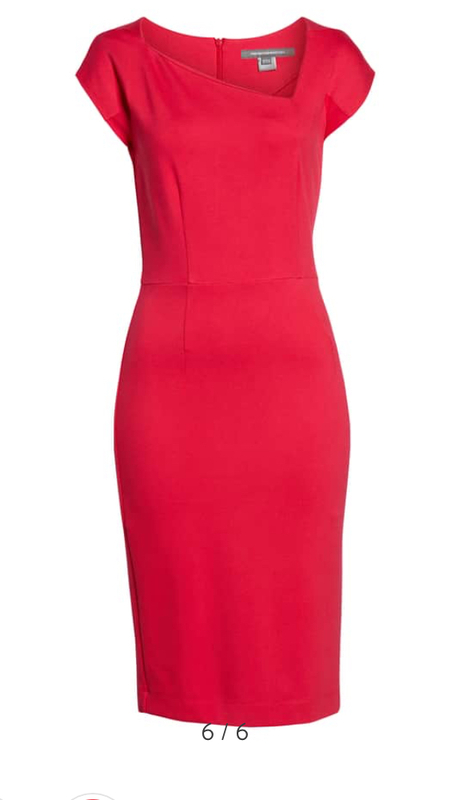 Not just for fun weekend wear, but it’s gala dresses and work clothes. This blue and white striped blazer from Tommy Hilfiger sucked me in because of its super cute elbow patches. They had paired it with a super “American-y” red, white and blue floral shell which I actually liked because the blazer toned down the bottom layers bold color mash. Of course dresses were red and blue everywhere – from this gorgeous evening number from Jessica Howard to a fun red, white, and teal dress for a summer weekend (clever twist throwing teal in that palette!). Head anywhere. Drop by Loft’s website. This is the first picture that pops up on the screen. Red skirt. Shell with red and blue. Red espadrilles. Red tee. They have red and blue in stripes and florals and solids. I could spend all my money on their blouses. It’s a fresh look for a bright spring. And as an added bonus, you’ll be ready for the 4th of July and Memorial Day in advance. I was wandering around a mall the other day (this never happens) and was amazed at the latest trends. Stripes, stripes everywhere. And red white and blue – well before the ole 4th of July. So today and next week for Fashion Friday we’ll cover the latest looks. Today it’s STRIPES. Next week, it’s the red and blue color combo. I love stripes. They feel optimistic. Well, bright stripes. I’m guess gray and black stripes would feel more prison like than optimistic. But bright stripes are what are sweeping the store fronts, on line and in store. As someone who wears a 10-12, not a 2-4, the trick is to either wear vertitcal stripes or stripes in accent areas like sleeves. Now you itty bitty girls go bananas with all the darling horizontal stripes out there. I just have to avoid them, or throw a blazer over it and mitigate most of the stripey fun. Here are some of my favorites right now, granted it’s a lot of tops, but seriously stripey pants might be too much (if you have daughters, there are adorable girl options too). 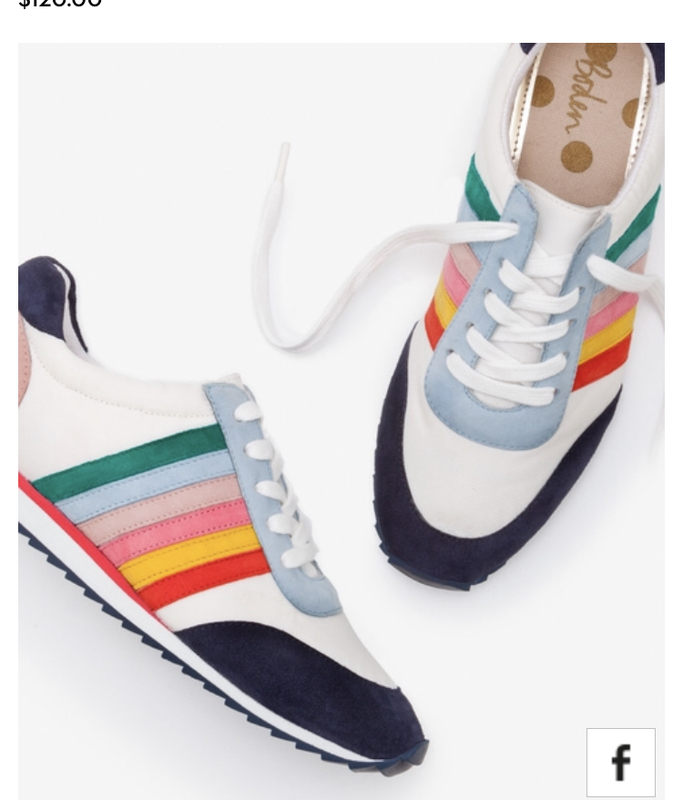 I apologize that most everything is from Boden but they are KILLING the stripe trend this season! I have never walked into a Forever 21. But this caught my eye. 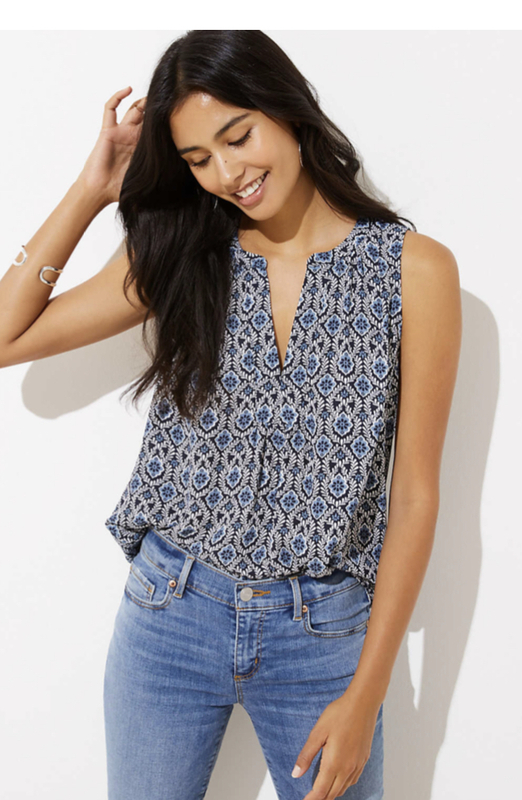 Wouldn’t this tank be great under a denim jacket for summer – or as she styles it if you don’t have a love-hate relationship with your arms (I love that they enable me to pick up my kids, I hate that they jiggle when I do…). 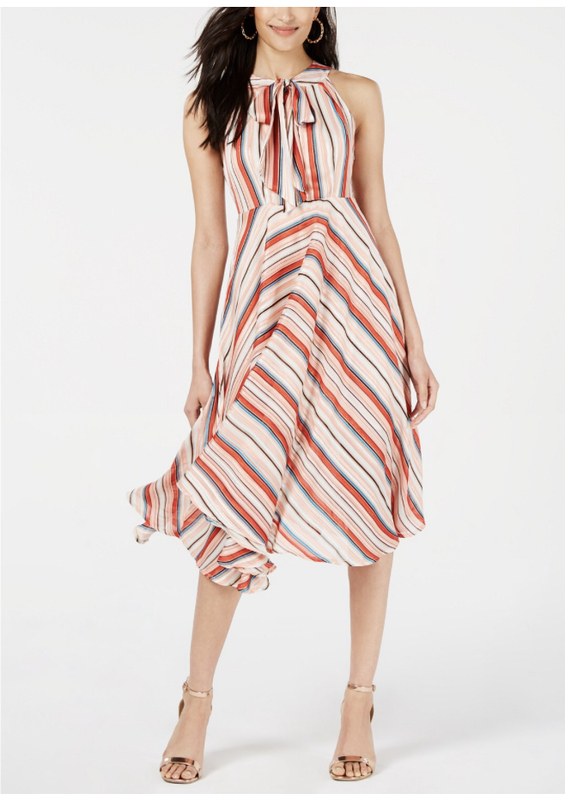 And while we’re at Forever 21, I love everything about this sundress outfit for summer. Yes with a cute crochet purse. Yes with the converse. Just yes to this whole thing. Who even cares if it’s for someone 21, it’s stinkin’ adorable. Would love your thoughts on this Verity jumpsuit. You know I straddle the fence on the jumpsuit. I’m a full no on jumpers but this seems like such a fun option for the summer. What say you? 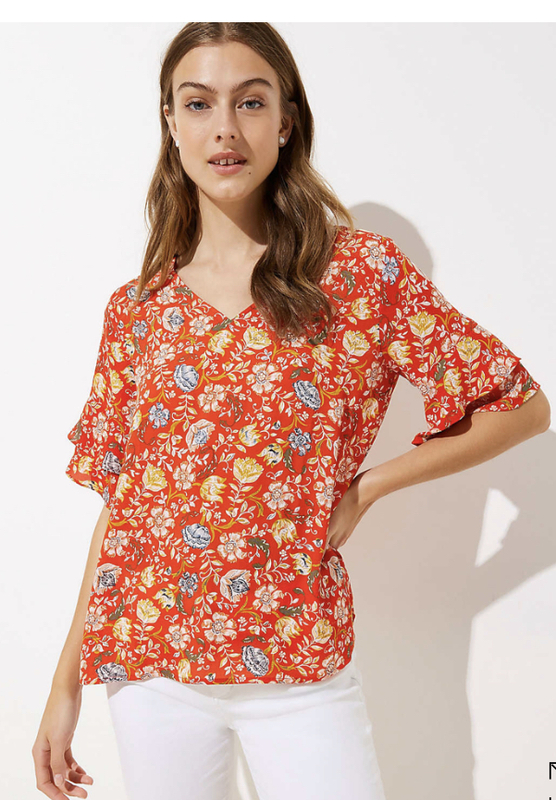 I think everyone should have this utterly joyful outfit for summer (with a little longer short). I don’t even care if these are horizontal, I love their happiness. Sneakers. I can’t even. Mic drop. Stay tuned. How to make patriotic fabulous next week! You have heard me talk about invitation’s coded attire in Fashion Friday posts before. But the hits just keep on coming my friends. You should hear what I’m hearing! Garage glam. Warehouse chick. Urban upscale. What’s a girl to do? In the coded attire post, I offered some tips on how to decode an invitation’s weird requests (time, location, etc.). For today’s Fashion Friday though, I offer specific advice for these garage/urban/grunge/warehouse/etc. type of invites. Some people are comfortable with a leather dress, and that would definitely do it. I know I wouldn’t feel comfortable – either from a professional standpoint or just an actual physical comfort perspective. Plus, on the Gulf, the weather is so unpredictable you could get hot fast in one of those. If you’re going to one of these uniquely coded parties, and it’s between the fall and early spring, a moto jacket with sheath dress and cool heels would fix you up. It reads chic but still professional. Some of these parties aren’t work specific parties but inevitably you run into people from your industry. If you do the Moto jacket, you could try it in a brighter color with a neutral dress. Or vice versa. I love this blush Michael Kors leather moto from Nordstrom’s (blush and light rose pink are everywhere). If you prefer traditional black leather, this levi faux leather moto is a steal of a deal from Nordstrom’s. You could pair the black jacket with something simple, a bright blue dress or red sheath with no adornments. 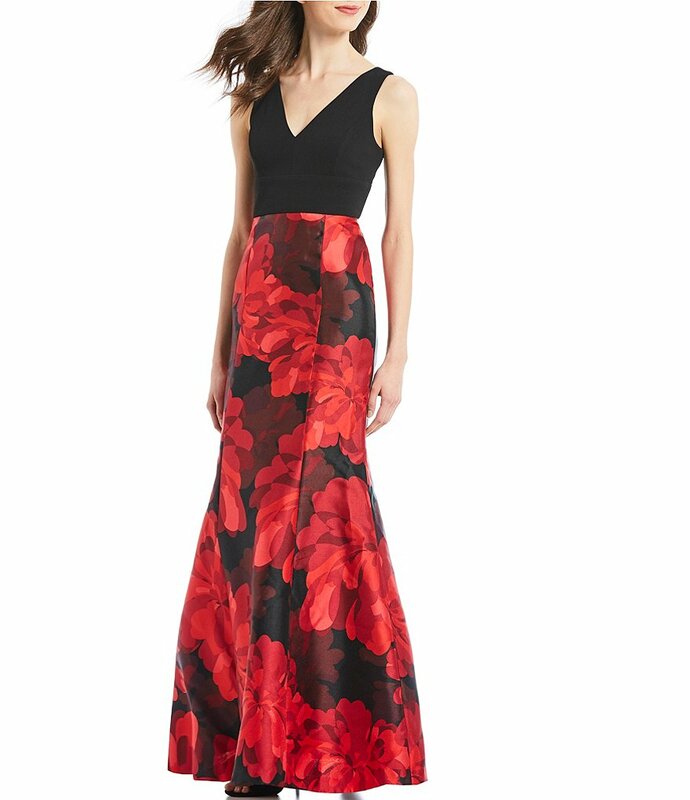 Or if you try a color in the Moto, and think the soiree will be dressier, pair your bold topper with a simple black lace sheath underneath, like this one from Bardot at Nordstrom’s. Then, polish off the outfit with some bold shoes. 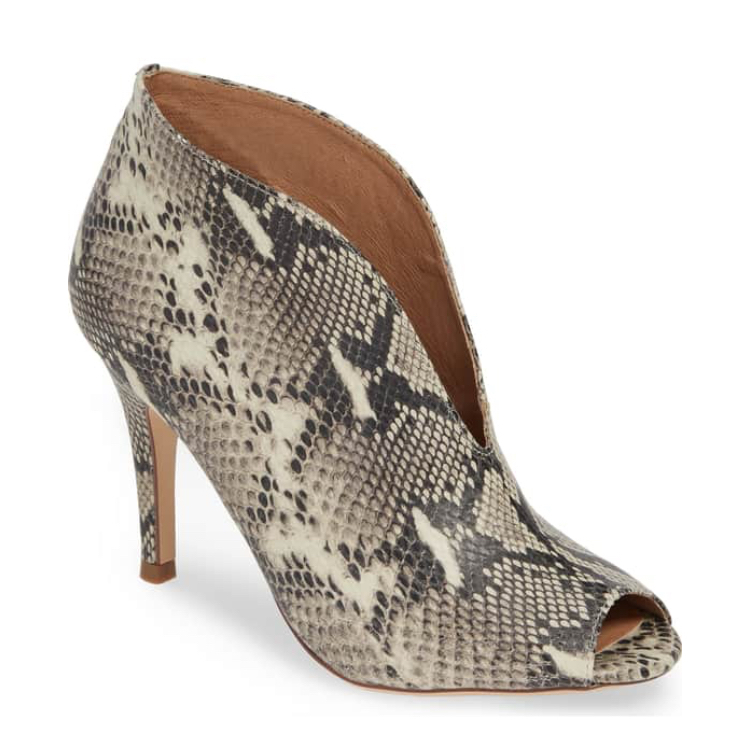 High pumps with studs like these from Steve Madden or Sam Edelman at Nordstrom’s or a funky animal print bootie like these Halogen’s. You could throw a long simple chain on as a necklace or belt to add another metal element. You’ll be the chic-est garage girl there! So what is the weirdest invitation code you’ve received? How did you decipher it (besides just phoning a friend, the best standby ever!)? Thank you for sending in all sorts of fun questions. Next week we’re going to tackle another “coded” invite attire question. But today, Fashion Friday is all about Gala Guidance. My post last week elicited texts and emails with questions and conundrums. If you’re interested about the funny twist my own gala gown took after Friday’s post, stick around to the end. I had folks texting me questions about specific gowns. It all boils down to this, consider your frame. If you are petite, then large loud prints or big bold ruffles are going to overwhelm you. If you are tall and slender, it’s easier to pull them off. Similarly, if you have a big bust, then a dress cut down to there is going to be hard to pull off in the real world. I realize Hollywood does it, but we don’t have tape specialists working in our bathroom to ensure we don’t experience a wardrobe malfunction. Below are some dresses I discussed with friends. The first had a pattern that would overwhelm my very petite friend but we found more muted patterns (the next two) for her to try. The final gown is for my slender friend with a smaller bust line. She looks smashing in every shade of blue and would knock the gala socks off in this. All dresses at Dillard’s. 2. Consider stepping outside your comfort zone, by renting. 3. Pick a focal point. If you have a daring neckline, you probably don’t need a statement necklace. You are the statement. If you have deep smokey eyes, then you don’t need bold lipstick. If you have a high-low hem with show stopping stillettos, then don’t overwhelm them with large sparkly earrings. Put on your dress. Decide where you want people to look. Work around your focal point. Don’t create too many distractions. Quality not quantity. If you read my post-gala dress saga below, you’ll see one dress I loved. But I felt heavy. I mean, I am heavier right now. But I felt heavy. You should feel beautiful. Don’t wear something you think is a statement dress but you don’t feel smashing in it. Similarly, don’t wear a long black gown because you don’t want to draw attention to yourself because of how you’re feeling about you right now. Feel beautiful. Get a friend to encourage you. Find something that is not only comfortable but also lovely to you. A color. A pattern. Fabric. Shimmer. Whatever. 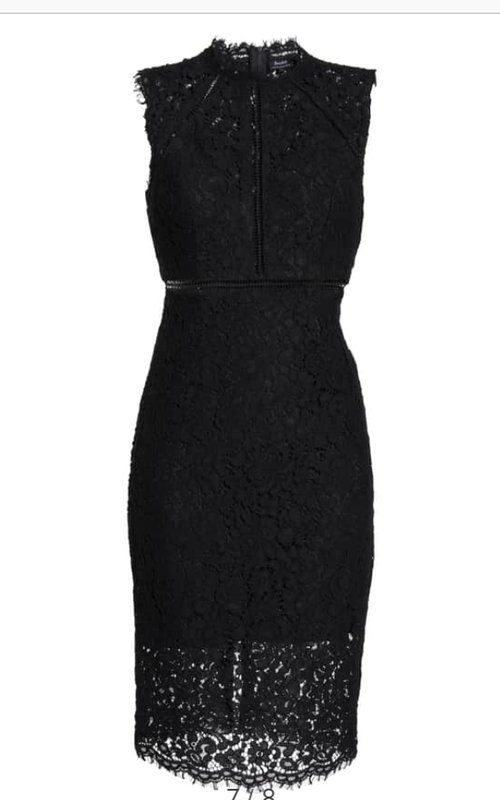 As for my post-gala gown sequel, as soon as I wrote last week’s post I thought, I don’t want a long plain black dress. Yes it looked pretty but it just wasn’t jazzy enough for me. So I ran up to Dillards because they were having a big evening gown sale. I tried on TWELVE dresses that were lovely. Yes, I’m on a spending freeze but I thought I might be able to exchange my gown even though I was past 30 days. The last gown I tried on I found while browsing the dozens of racks. 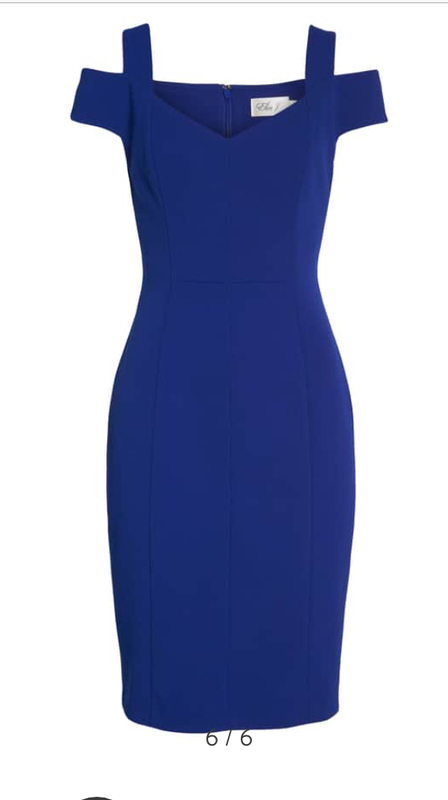 It was the exact same as my black dress but in a deep royal blue (plus they only had one and it was my size!!!). I saved it for last to give the other gowns a try. Previously, I had tried two blue gowns that I absolutely adored for their color (see above), but I just didn’t feel confident or comfortable in them because of the fit across my abdomen. When I put the old/new dress on, I loved it. Still it was my favorite gown (a nice confirmation of the first one). AND it solved my problem with it “just being” a black dress. I pleaded my case to the saleslady (because of the 30 day return policy). She said if I would run home and get my dress, she’d hold this one until I returned. She could give me store credit for my black dress and apply it to the blue one. See you next week fashion friends.